This sunny townhome rental is the site of many family retreats, why not yours? Aspenwood 6544 is a 2 bed, 3.5 bath townhome on Lake Superior located in Tofte, MN. The balcony off the living room is a great place to relax and take in the Lake Superior views. The kitchen and dining room are open to one another and also feature a small office area. Granite counter tops and modern full sized appliances make this kitchen a great place for preparing meals. Seating for six in the bright dining room. Enjoy watching the waves of Lake Superior as you dine. The dining area opens up into the kitchen. The lower level living room features a flat screen TV, sleeper sofa, full bath, and additional eating area. Walk out of the lower level and you are just yards away from the staircase to a private section of Lake Superior shoreline. Or just take a seat and enjoy the views from the lower level living area. Or step on outside and enjoy the views from the lower level. Tons of natural light in the spacious master bedroom. The master bedroom has a queen bed. Enjoy this incredible view of Lake Superior out of the master bedroom windows. The guest bedroom has a full bed. The large guest bedroom has plenty of space to unwind. The upper level main bathroom has a jetted tub and shower combo- great for relaxing after a long day. The other bathroom on the upper level has a glass doored walk-in shower. The lower level also features a full bathroom for a total of 3.5 bathrooms. The laundry area on the upper level is available for guests, great for extended stays. Enjoy 600 feet of Lake Superior shoreline, private to the Aspendwood townhomes. Campfires on the beach are permitted Enjoy the sun rise and even part of the sun set over the lake during certain times of the year. Great for larger groups- there are several Aspenwood units to choose from with 1, 2, 3, and 4-bedroom options available. Aspenwood 6544 is perfectly situated for experiencing everything the North Shore has to offer. Two bedrooms and a new, cozy sleeper sofa allow groups of varying numbers to feel completely at home. The three level townhome also features three and a half bathrooms. Stunning views of Lake Superior highlight each of the three levels, as does the outdoor seating area. To get up and close and personal with Lake Superior, simply stroll down to the 600 ft. of ledge rock and small cobblestone beach that you’ll have access to. There are an assortment of locally-owned restaurants in the nearby towns of Tofte, Lutsen and slightly further up the road in Grand Marais. Ranging from fish markets to pizza parlors, there are options for all palates on the North Shore. In addition, Aspenwood 6544 is the perfect setting to prepare a home-cooked meal in the fully stocked kitchen and dining area. After a busy day shopping, recreating in the area or on the water, make your way upstairs to enjoy a peaceful night in one of the two bedrooms. The master bedroom features a queen bed and looks directly at the mighty and majestic Lake Superior. The second bedroom has a full bed and guests will enjoy private bathrooms with both second level bedrooms. The lower level family room includes a modern gas fireplace and a large dining table is also in the family area which is ideal for playing games. The sofa in the family room converts into a queen size bed. 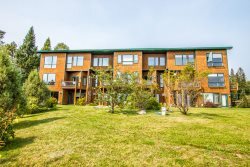 This townhome is close to many North Shore activities for lovers of the outdoors, including the spectacular Superior Hiking Trail, Minnesota’s grandest downhill ski resort, Superior National Golf Course, snowmobiling, cross country skiing and ice fishing. In addition, there are dozens of locally-owned shops for those looking to take home a treasure from the North Shore. House was great, allowed us space when needed yet plenty of areas to come together. Location was central for us to explore along the north shore. Great customer service. Lovely lady in the office took our recycle for us because we were not sure where to put it. We loved our stay. This was our fourth visit to Aspenwood but the first time in unit 6544. This is a very nice unit and very well laid out. The only suggestion is we would have is to get pot holder/hot pads for the kitchen and to provide a box of Kleenex in the bathrooms. We loved everything else and hope to be back for another visit. The home was immaculate with 3.5 baths for 4 women. Need i say more. We came, had a great time and then left with no sight of staff. We actually didn't mind that at all since we are rather a low maintenance group of ladies. We were at Lutsen to ski, so location was ideal. The home was beautifully appointed, with fine amenities, all in working order. We liked that there were 3 full baths, and a main floor powder room. Would have liked if kleenex/tissue was provided. Property was very clean upon arrival, and outdoor area was also clean with nice landscaping. More information on the in-floor heating system would be helpful, given we did not have experience with that heating source. The guest information binder was helpful, though many local restaurants were not open during our stay, it would be helpful to include accurate hours/dates of operation. Fortunately, we had no need to contact property service provider. The kitchen supplies were above our expectations, that information could be provided on the website, as we would have planned to cook more on site had we known the supplies were available. This Condo was an excellent choice for a skiing holiday at Lutsen Mountain. It is very close...like 10 minutes. The Condo was absolutely amazing..infloor heating, a washroom on every floor (4). All the amenities you could ask for, an absolutely spectacular view of Lake Superior. Snowplowed immediately. Well built, well maintained Condo that will certainly be utilized by this family in the future. The home was gorgeous, we enjoyed the views and the cozy downstairs living room. We were there for New Year's Eve and wanted to go celebrate at papa Charlie's but couldn't find a ride there and back- a shuttle service would've been great! Otherwise everything else was fantastic and we had a great time at the house. We stayed for 3 nights during the Lutsen 1/2 price lodging and ski holiday package. I ended being really happy the ski-in ski-out condos at Lutsen were sold out. The condo at Aspenwood had beautiful views of the lake from every room. The high end kitchen appliances, in floor heat, gas fireplace and comfortable beds made it like home (only better). Well worth the 10 minute drive to the hill for a larger place and less money. We loved staying at the Aspenwood home. It was beautiful, clean and spacious and worked perfectly for our family. We enjoyed having a kitchen to prepare some of our meals and loved looking out on Lake Superior. The views were terrific! Since it was right next to the highway, the noise on that side was a little loud for our kids when they were sleeping. That was probably the only downside. We enjoyed also walking down to the beach on the scary stairs. :) The kids thought it was a great adventure. It was great having laundry in our unit as well. And the location along the North Shore is just right for going either north or south for hiking and sightseeing each day. Nice view of the lake and the unit is comfortable.